Certainly as Christians we should be humble and pray. However if one is already in disobedience, as Francis Chan was to give his blessing to a false prophet like Mike Bickle and his IHOP organization, then I’m afraid that they’ve already set themselves up for being deceived; and for failing to honor God. Lambert tells us, “Rather than simply believing criticism, [Francis Chan] chose to look more deeply at both sides and take this opportunity to share the message the Lord gave him.” Rather, based upon what Chan gushed in his endorsement of Bickle and IHOP, we’d be better off saying that Chan would simply choose to ignore that criticism. 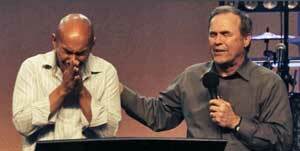 I think that his coming speaks much about him and also about the leader of the IHOPKC movement, Mike Bickle. If Bickle was what some people make him out to be, it would have been potentially dangerous proposition to invite someone to like Francis Chan to address his ministry’s conference. On the contrary; Francis Chan’s sappy sentimental experience over doctrine approach to serving the Lord, which leads to a wishy-washy view of Scripture, made him the perfect invitee. I’m not surprised at all Bickle and IHOP gave Chan “free reign” to speak. Likely they knew he wouldn’t be critical of them anyway. Herein lies another example of spiritual danger brought on by apostatizing evangelicalism’s embrace of Contemplative Spirituality/Mysticism and charismania. For you see, weeping and praying—even with heads down—to some supposed well-received message, in and of itself, proves nothing. For example, you can see this all the time in services held by New Apostolic Reformation (NAR) spiritual wing nuts like Bickle or his friend Apostlette Cindy Jacobs. We would even expect to have seen this on occasion in papal services at the time of the Protestant Reformation as well. Yes, Francis Chan’s message did contain many of the right words in regard to the Gospel; but, I would offer, they were not spoken in the power of God. That’s what missing in these services. The fact is, Chan was dead wrong to endorse NAR heretic Mike Bickle and his egregious cult-like IHOP followers. In closing this, for now, it’s my opinion that much of the visible Christian community is absolutely rife with a growing spiritual blindness. In that regard, now each of us really needs to seriously begin coming to grips with when one is to separate themselves from those who run into that darkness to spread apostasy. The concept of ‘platform fellowship’, as defined by many conservative evangelicals, allows them to justify in their own minds the freedom to associate with, worship with, preach with and lecture with those that, on a strictly Biblical basis, they should distance themselves from. It is in many ways an attempt to find a way for men to bring together what God has put asunder!